Recipe for Watermelon Coconut Cake with Raspberry Filling. This cakes makes a spectacular presentation of a fruit everyone already loves. Slice width wise into 3 slices as you would a cake. Place 1 slice of the melon cylinder on top of a serving platter. Surround it with a ring of coconut. 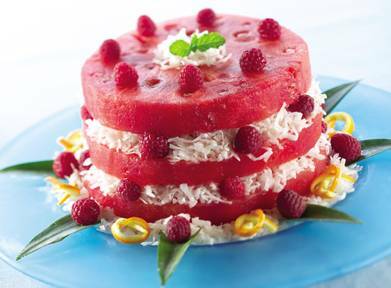 Place 1/3 of the remaining coconut and raspberries over the slice and repeat to form a 3 layer watermelon "cake" with the raspberries on top arranged attractively on the coconut. To serve, slice into wedges and present them upright.